Learn about the Strategic Prevention Framework model for preventing substance abuse and addressing other community issues. What is the Strategic Prevention Framework? Why use the Strategic Prevention Framework? When should you use the Strategic Prevention Framework? Who should use the Strategic Prevention Framework? How do you use the Strategic Prevention Framework? Nearly every community – large or small, urban, suburban, or rural – must cope, to some extent, with the use and abuse of alcohol, tobacco, and other drugs. Most communities try to combat this problem, and some are reasonably successful. Others find themselves doing everything they can think of, and barely staying even, or – worse – losing ground. The difference is sometimes in the way they approach the problem.Those that are most successful often try to prevent the problem from starting. They focus on the community as a whole, and try to devise ways to help the community members who are most at risk – typically youth – to avoid the behaviors or situations that would put them in harm’s way. Although they don’t ignore law enforcement, medical treatment, policy decisions, public education, or other actions necessary to address the problem as it already exists, these successful communities try to reduce substance abuse permanently by taking a long-term perspective. Most of the models we’ve described in this chapter look to both the present – addressing a current issue – and the future. In this section, we examine another that does the same – the Strategic Prevention Framework developed by CSAP, the Center for Substance Abuse Prevention, part of the Substance Abuse and Mental Health Services Administration (SAMHSA) of the U.S. Department of Health and Human Services. The Strategic Prevention Framework (SPF) outlines a process that an organization, initiative, community, or state can follow in order to prevent and reduce the use and abuse of alcohol, tobacco, and drugs. This framework can also be applied to other community issues, such as violence, health-related problems (obesity, heart health, diabetes, HIV), homelessness, or racial tensions and discrimination. By the same token, while SPF focuses primarily on youth, there is no reason that the model can’t be adapted to any population group. The framework addresses both risk and protective factors. Risk factors are those elements within an individual or her environment that make her more susceptible to particular negative behaviors or conditions. Protective factors are the opposite – those elements within an individual or his environment that make him less susceptible to those negative behaviors or conditions. The availability of alcohol in the community (number of liquor stores, willingness of adults to buy alcohol for teens). Community norms that tolerate and expect alcohol use among youth and adults. Acceptance of alcohol use and abuse may include such elements as the acceptance of binge drinking on weekends as a “stress reliever;” parties where large quantities of alcohol is consumed as a norm; and alcohol availability at public events – festivals, concerts, etc. This kind of tolerance is not confined to low-income or working-class communities. In many upper-class communities, at least until 20 or so years ago, large amounts of alcohol were consumed at dinners, weddings, etc., with the assumption that guests – many of them underage, and most at least slightly drunk – would then drive themselves home. Poverty and lack of economic opportunity for young people. A family history of alcohol abuse. An early start – preteen or young teen – in alcohol use. Good communication between children and parents. Peer support for avoiding alcohol abuse. Consistent community and family values that oppose alcohol abuse. The Strategic Protection Framework addresses risk and protective factors with a five-phase process. We’ll list the phases here, and discuss them in more detail later, in the “How-to” part of the section. The Community Tool Box has hundreds of how-to sections that can be used to help implement the Strategic Prevention Framework in your community. 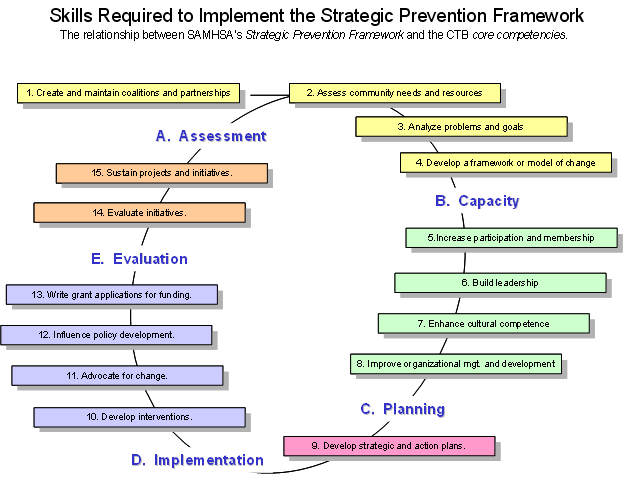 The above Strategic Prevention Framework diagram is overlaid with the core competencies for community health and development found in the Community Tool Box. 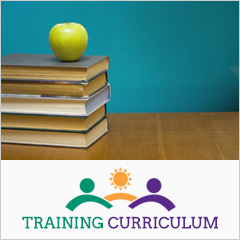 The following links will take you to Community Tool Box Toolkits and how-to sections for these CTB/SPF related core competencies. Identifying and understanding the population’s needs. Determining necessary resources and their availability. Capacity development. Developing the community’s capacity to engage in a prevention effort involves mobilizing the human, organizational, and financial resources necessary, and then providing the appropriate training and technical assistance so that the community has the knowledge and skills to plan and do the work. Planning. In this phase, a diverse group of stakeholders creates a plan with goals, objectives, and action strategies aimed at meeting the needs of the community. In the course of planning, the group adopts a logic model or framework for action; chooses from among a number of possible evidence-based “best practices;” and determines the costs and other resources that will be needed to implement the plan successfully. Implementation. The plan is carried out. Evaluation. Although listed as the last phase, this actually goes on throughout the process. The program is evaluated in terms of process (Did you actually carry out what you planned to do in the way and time period you planned? ), impact (Did your program have the intended effect on the targeted risk and protective factors? ), and outcome (Did the program achieve its overall community-change goals?). The results of the evaluation are then used to adjust the program to make it more effective, and the cycle begins again. Given that there are a large number of models available, what are the advantages of using SPF? SPF is inclusive and participatory. The framework involves the representation of all stakeholders in the process from the very beginning, including the group the effort is aimed at. This leads to community ownership of the prevention program, which in turn leads to community participation and support, both major factors in its potential for success. SPF emphasizes the role of the community in prevention. A cornerstone of the framework’s philosophical base is that prevention only works when the whole community supports it, and when the real needs of the community are taken into account. This agrees with the WHO/Healthy Communities conception that health is a community issue, regardless of who is affected by a particular condition, and that successful health promotion efforts must take a community perspective. SPF is open-ended, and encourages communities to find their own solutions. SPF doesn’t advocate a set program to approach prevention, only a general process. It provides a broad range of proven options to choose from, and encourages communities to develop their own variations where appropriate, thus empowering them to solve their own problems and develop their own assets for the future. SPF aims to create long-term social change by focusing on risk and protective factors that can be influenced by short- or medium-term prevention efforts. The emphasis on risk and protective factors both makes prevention manageable and makes it seem more manageable. The fact that it doesn’t seem overwhelming makes communities more likely to keep at it and be successful. SPF provides communities with proven, evidence-based models to choose from. Rather than prescribe a particular program, SPF provides resources to help communities find best practices that suit their own needs. SPF has associated technical assistance and links to other practitioners and programs. Through its website, CSAP links communities and prevention programs to a great number of online resources from a variety of sources. In particular, we refer you to the Community Tool Box supports for Strategic Prevention Framework founding in Tool #1 of this section. Other resources include the CSAP Prevention Platform, a set of program development, implementation, and evaluation tools, the CSAP and SAMSHA websites and other best practices. SPF’s focus on risk and protective factors can improve the long-term well-being of the community. Over and above their influence on the issue at hand, most risk and protective factors are general as well. Such protective factors for youth, for instance, as parent-child communication, attachment to the community, self-respect, and high expectations are likely to lead not only to a reduction in dangerous and self-destructive behavior, but to young people themselves developing into better parents and citizens, and becoming role models for the next generation. There is a fine line between prevention of a negative condition (e.g., substance abuse) and promotion of a positive one (e.g., a healthy lifestyle.) A well-run prevention program that focuses on eliminating risk factors and strengthening protective factors can turn into a promotion program that encourages citizens to take positive steps to make their lives as healthy and fulfilling as possible. Limited resources. It should be noted that, while CSAP makes grants to states and communities, those grants are relatively few. States distribute much of their funding to communities, but grants are competitive, and it may be difficult, particularly for communities with few resources, to obtain the funds that might increase those resources. Those who are interested in implementing SPF on their own can expect a certain amount of technical assistance and guidance from the CSAP and SAMHSA websites, but little else. For those that lack resources, this may not be enough to make it possible to use the framework. SAMHSA/CSAP awards grants to states under the SIG (State Initiative Grant) program; to community coalitions under the Drug Free Communities Support Program; and to community organizations to prevent the spread of methamphetamine use. In addition, SAMHSA awards grants to a variety of organizations, institutions, and agencies for the prevention and treatment of substance abuse for those with HIV/AIDS. While the total amount of these grants is relatively large, the number of recipients is still quite small, and most are large organizations and institutions. States may distribute their SIG’s to smaller organizations in communities, but the amount of money available is still relatively modest, and not all states have these grants. Insistence on the faithful implementation of evidence-based programs. While it certainly makes sense to use proven practices, rather than trying to reinvent the wheel, it is also important to understand that even the best programs don’t necessarily work everywhere, and that all parts of a given program may not be appropriate in a particular situation. An insistence on following program implementation guidelines exactly can ignore the knowledge of the community that may be a local organization’s greatest asset. A large administrative load. Reporting requirements on CSAP and SAMHSA grants are considerable, and cover every aspect of the development, implementation, and evaluation of the prevention effort. For many small community-based organizations with limited staff, this requirement may make it impossible to compete for grants. These disadvantages largely apply to those who seek CSAP grants to implement SPF, either through state funds, or directly from CSAP. For those who simply want to use the framework, CSAP does provide access to a large amount of information, and can make it possible to put together an effective prevention program using local resources. In that case, having to contend with the potential problems raised by points 2 and 3 is not an issue. Prevention, in the ideal, means just that. The best time to start a prevention program is before there’s a serious problem. In fact, with its emphasis on risk and protective factors, particularly for youth, the framework could act as prevention for nearly any undesirable issue, as well as promotion of healthy behaviors and environments. In that respect, it’s similar to asset development. The reality in most communities, however, is that given the problems that already exist, most issues don’t get addressed until they reach crisis proportions, or at least become cemented in the public consciousness. Thus, the best time to embark on a strategic prevention initiative may be when the community is ready to turn its attention in that direction. You can often hurry this process along by assessing where the community is at, and beginning a campaign to raise that readiness to the next step, or whatever step is necessary for the community to get on board with a prevention plan. The first part of a prevention initiative may in fact be an effort to increase community readiness. You may not begin to devise and implement a prevention program for a while, but the readiness development is all part of the same effort. When resources are available. Some of those resources may come from CSAP, in the form of grants and technical assistance. Others may come from the community itself, and consist of people with successful prevention experience, local sponsorship for prevention efforts, funding from community foundations or municipal agencies, media support, etc. When a community problem has entered the public consciousness, but before it has reached crisis stage. The ideal time to begin a prevention effort is before the problem has become so large that prevention may take a back seat to dealing with its immediate effects, but after people have become aware that it could get considerably worse without some intervention. It’s a good time to persuade the community that a prevention program can help to create a future where the issue at hand simply isn’t an issue at all. When a community problem has reached the crisis stage. In this situation, prevention, as implied above, may be harder to sell. If prevention isn’t part of the solution, however, the problem will persist. It’s important to convince the community that a prevention effort is vital to its long-term health. When there’s public focus on an at-risk population, particularly youth. The best way to reduce the risk for any population, and particularly for youth, who are still unformed in many ways, is to keep them from embarking on high-risk behavior. Working with young children and their families, for instance, can have its effects not only when those children become adolescents, but – more profoundly – when they become parents themselves. If the public understands that, prevention can become the mode of choice when addressing a population’s risk and protective factors. When there’s a community economic development effort under way, and people are looking at the community’s quality of life. Because SPF has the potential to influence substance abuse over the long term, it’s an ideal way to approach quality-of-life issues. An ongoing, successful prevention program is a community asset that can be used to attract businesses and their employees to a community. When a grassroots movement for community improvement has arisen, and is looking for a way to address community issues. Many groups of this sort are concerned with long-term social change. A prevention effort can be an ideal vehicle to address such change, because it can deal with both the current situation and the next generation. An ongoing substance abuse prevention program can affect what happens next year, but can have even more serious effects on what happens in 20 years. As with many of the “Who...?” questions in the Community Tool Box, this one not only has more than one answer, but is, in reality, more than one question. Who might implement SPF? The multiple answers here stem both from the way CSAP grants are made and from the fact that SPF is intended to be inclusive and participatory. State Incentive Grants (SIGs), which go to states to fund statewide assessments and to be distributed among communities for state-monitored local prevention programs. Drug Free Community Support Program grants, which go directly to local community coalitions. Grants to state and local organizations, institutions, and agencies to address methamphetamine use. Grants to state and local organizations, institutions, and agencies to address substance abuse among those with HIV/AIDS. The first answer, then, is that SPF should be implemented by those who administer these grants at the state and local levels. They might be state and local health and human service officials, coalition coordinators, human service providers, universities, hospital and clinic administrators, etc. But, because of the nature of the grants, these folks are only the beginning. They are required to involve all stakeholders from the beginning, and that implies a much broader range of people. Members of the population(s) most at risk. Medical professionals, particularly those who work directly with at-risk populations. Alcohol- and drug-treatment professionals, as well as researchers in the field. Elected and appointed public officials and policy makers at the appropriate level. All or most of these groups would probably be part of the Epidemiological Working Group mandated under the various grants, but should also be part of any SPF effort. As stated constantly in the Community Tool Box, we believe that, in most cases, participatory planning and implementation of programs leads to efforts that both meet real community needs and assure community support. In addition, there are those who might run SPF programs that aren’t funded by CSAP, but that simply use the framework to structure their work. They are likely to be community-based health or human service organizations, community coalitions, local health departments, or similar groups that engage in prevention efforts either to respond to community needs or as part of a larger local initiative. Whom should SPF efforts serve? This question asks both how those efforts should be aimed and who the targets should be. CSAP identifies three kinds of programs: universal, selective, and indicated. Universal programs are geared toward a whole community or part of a community, even though everyone they reach is not necessarily at risk for substance abuse. Selective programs are intended to reach at-risk groups: particular populations, neighborhoods, age groups, or cultures. Indicated programs serve referred individuals who have been identified as at high risk for substance abuse. A typical universal program might involve community education efforts through the media, schools, and organizations. It might try to explain the effects of alcohol and various other drugs, conduct prevention classes in middle or elementary school, identify risk and protective factors, let people know where they can get more information, and generally raise community consciousness and concern about the issue. It might be aimed at a neighborhood, at the community as a whole, or even at a whole county or state. Who would be served in this case would be everyone the program could reach, in the hope of establishing community norms that work toward prevention, and alerting the community to existing risk factors. Youth, particularly those of middle- and high-school age. This is often the population at highest risk for substance abuse, for a number of reasons. Adolescents are risk-takers by nature; they tend not to think carefully about the consequences of their actions; and most will do almost anything when encouraged by peers. Adolescence, or just before, is also the typical age for people to start using alcohol, tobacco, and other drugs. If they can be persuaded not to start at all, or to delay until they’re mature enough to understand what they’re doing and what the results might be, the chances of their using and abusing these substances are greatly reduced. This is not to imply that all adolescents who use alcohol or drugs will become abusers. In the U.S., large numbers of adolescents drink – often to excess – and somewhat smaller, but still significant, numbers smoke marijuana. Only a small percentage of these become dependent on these or other substances. That doesn’t change the number of non-dependent teens killed or injured in alcohol- and drug-related motor vehicle or other accidents, or the amount of emotional and property damage they may cause or suffer while under the influence. If all a prevention program does is to convince kids to think for a second before they act, it will have performed an enormous community service. Pregnant women. Current medical practice warns pregnant women not to drink at all during pregnancy. Excessive drinking during pregnancy can lead to fetal alcohol syndrome, which produces babies with a number of serious developmental problems, almost always including brain damage and abnormal facial features, and often including growth problems and mental retardation. Smoking during pregnancy can be responsible for low birth weight and other problems for the baby, over and above its effects on the mother herself. Although the effects have not been as carefully studied as those of alcohol and tobacco, drug use – particularly of heroin and amphetamines – appears to pose dangers to fetal development as well. An effective prevention program can eliminate a lifetime of difficulty for both mother and child. Elders. Older people who live alone, far from family and often isolated, may be at risk for alcohol abuse. As metabolisms change with age, elders may react differently to medications. They may be overmedicated, or their medications may interact with one another or with alcohol to produce apparent dementia or other symptoms. The amount of alcohol they once drank without problems may now be too much. Worst of all, these issues are seldom raised by health professionals, social workers, and others who work with older people, and may go unrecognized. Prevention programs can raise and address them, and lead to a longer and more productive and satisfying later life. The homeless. Many people who are homeless struggle with addictions of various kinds. Their substance use is often one of the reasons that they are homeless, and contributes to their difficulty in changing their status. Substance abuse in the homeless population is also often tied to physical and mental health issues leading to the misuse of various medications prescribed for physical and psychological conditions, or self-medication with alcohol or narcotics to dull the emotional or physical pain of mental or physical illness. Indicated programs focus not on probabilities (populations likely to be at risk, for example), but on specific individuals who are known to be already involved in substance use. Depending on the program, these individuals could be identified and referred by school personnel, parents, the court system, law enforcement, social workers, therapists, or others who have contact with them. In such cases, it would be not only the participants, but those who referred them who are the users of SPF. As described above, the SPF has five phases. We’ll examine those in more detail here to see how they guide the use of the framework. SAMHSA/CSAP provides information, instruction, and technical support. There you can find a template for planning your effort; information on such topics as risk and protective factors; and links taking you to lists and descriptions of evidence-based programs and to numerous other helpful sites, including the Community Tool Box. Phase 1: Assessment. In the assessment phase, you determine community needs and resources, and identify existing risk and protective factors. One of the ironies of a prevention effort is that those most affected and damaged by the issue – substance users and abusers – are those least likely to want to be involved. Perhaps the best way around this, in addition to recruiting workgroup members from the population(s) most at risk, is to include those recovering from alcohol and drug dependency. They understand the substance abuse culture from the inside, while being clear on the need to prevent people from joining that culture. Assess community needs and assets. The ideal here is to conduct a full community assessment. If the sponsor of the assessment is the municipality (the Mayor’s office, for example), a large institution or organization (a university or a large-city United Way), or a state agency, it will probably have the resources to do that. If it’s a small, community-based organization, or a coalition of such organizations, it may well have to rely on volunteers and on inexpensive techniques, and to focus more narrowly, unless members of the workgroup are able to provide financial and other resources. How great are the use and abuse of alcohol, tobacco, and/or other drugs in the community? What substances seem to be most available? Most used? What are the trends in community substance use and availability? Which populations are most at risk? Where (geographically) is the problem most serious? Are some substances particularly favored by particular populations, and others by others? Is the same true for geographic areas? How early do most users of particular substances begin their use? What kinds of prevention efforts and treatment services already exist? How successful are they? How many people can they serve? What substances or aspects of substance abuse pose the biggest problem for the community? Surveys. These may be conducted in person, by phone, by mail, or by e-mail. They can be given to groups or individuals, at random or by selection (population, geographic area, age, etc.) If they’re well-conducted, they can cover various topics, and yield a broad range of answers. Focus groups. A focus group is a specific kind of guided discussion intended to get information on a particular topic from a group. It can be used effectively for assessment, but requires a trained facilitator to draw out the participants and keep them on the topic. Community leaders – those people from various walks of life whom others look to for leadership and guidance. They may hold leadership official leadership positions in government or institutions, be respected for their professional status or social leadership, or they may simply be known as people of integrity and wisdom. The population of interest, or the one most at risk. Generally, these are the same, although they may not be. You might focus on youth, for instance, even though the worst problems are among adults, in the hope of curbing substance use in the future. Those who deal with the population of interest – health and human service workers, teachers, police, youth outreach workers, etc. Those affiliated with the population of interest. Parents, extended families, AA and AlAnon groups. Policy makers. Legislators and others who determine laws and regulations regarding substance use, as well as those opinion leaders in the community who help to determine attitudes toward it. People who’ve done research on the issue in the community. These may be academics, or may be health and human service providers. Observation. There are different ways that observation might be used in this kind of community assessment. It could mean walking the streets and noting conditions, watching to see whether kids approach adults to buy alcohol for them outside of liquor stores, noting obvious crack houses, or simply watching interactions in various neighborhoods and parks. Participant observation could mean riding or walking a beat with a police officer, getting to know drug dealers or runners, or actually making a buy. The range really depends on what you’re looking for, and what you and others involved in the assessment are capable of. Public records. Much of your work may have been done for you by various federal, state, and local agencies. In the U.S., the Census, conducted in full every ten years, is a treasure trove of demographic and other information. Local agencies, the National Institutes of Health (of which CSAP is a part), the Department of Health and Human Services, state youth service departments – all may have collected information on substance use in your community that’s just waiting for you to look up. Assess community readiness. Community readiness is the degree to which a community is ready to take action on an issue. Once you understand your community’s level of readiness, you can plan your effort to start at that level and move the community to the next, and to continue to move the community, a level at a time. Understanding where the community is and starting from there is incredibly important. People simply won’t do what they’re not ready to. Until community members are aware of the problem and believe it is important, it’s unlikely that you’ll get much of the support needed for a successful prevention effort. Your first tasks in that case may be to get the community to that point, and to involve it in planning. Once community members understand the concept of prevention and see the need for it locally, it’s more than likely they’ll support and participate in your effort. Tools that identify the dimensions and levels of community readiness have been developed. An instrument for determining community readiness that can be easily applied and scored by community members can be found in Community Readiness, and related Community Tool Box sections that support improving readiness. Determine the most pressing need that a prevention effort can influence.There may be many possible areas where prevention is needed – among teens, among elders, among people below the poverty line, etc. The questions are where your effort can have an impact, and what you have the resources to do. The substance abuse problem among a particular population may be more than you have the ability to take on at the beginning. You may want to focus on a more manageable population, or a different issue – alcohol use as opposed to crack, for example – that you can be successful with, and thereby build your capacity to take on something more formidable. Not only does the community have to be ready to take on a prevention effort, but it has to have the capacity to do so. This includes awareness and knowledge of community substance use and abuse; an understanding of how to create, implement, and maintain a prevention program; other community resources that can serve (are serving) to address the issue; widespread community support and participation; and the will to sustain the effort for the long term. This doesn’t mean that everyone in the community has to understand, support, and be willing to participate in a prevention program, although this may be an ideal. Rather, it implies that there has to be a critical mass of support and knowledge in order to run an effective program. Start with your core group. The group that conducted the community assessment and others that have been interested in the prevention effort from the beginning constitute a core group. Many or most of them may be willing to remain active in continuing to plan and implement the program. Even if they’re not, they may help to recruit others to participate in the next phases. Choose or develop a logic model or theory of practice to guide your effort. A logic model will expand the SPF framework to help you map out exactly how you’ll approach. Use what you know about the community’s level of readiness to publicize the issue and encourage participation. Depending on what people in the community are aware of, you may want to draw attention to the issue of substance abuse, and emphasize its existence and nature in the community. Using the stories of community members recovering from substance abuse, especially if they’re willing to tell those stories themselves, is a powerful way to emphasize the need for prevention. It’s important to enlist and work with the media here as well. If the community is already well aware of the problem – you may be able to concentrate on gathering support and volunteers to start planning your program. You may want to form a community advisory board or similar group to represent the effort. Expand the network of community members interested in preventing substance abuse. As the community grows more knowledgeable about substance abuse, it should be easier to recruit people to help with the prevention effort. You can reach community members through the media, through brochures and bulletin board messages in appropriate places, and – most effectively – through personal contact. Seek out individuals for either their skills or their enthusiasm, and ask them to do things they’re good at and/or find interesting. You may be able to find volunteers who are experienced in curriculum development, public relations, youth work, filmmaking, and other areas that might benefit the effort. People whose only apparent skill is a willingness to help can network, provide logistical support (stuffing envelopes, scheduling meetings, making phone calls), and help to recruit still others, as well as developing leadership capacity over the long term. The planning phase is at least as important as any other for two reasons: first, it plays out the participatory nature of the effort, thereby gaining both a variety of thinking and community buy-in, if it’s done well; and second, it creates the structure, organization, and content of the actual prevention program, by which that program will rise or fall. As a result, it’s important to go about planning carefully. More time spent on this phase can mean less trouble and greater success over the long run. Assemble a planning team. This team might be the same as the assessment team, might include some members of the assessment team and some others, or might be entirely different. It might include members of – or be – the advisory board, if you have one. Whatever the overlap or lack of overlap, team members should represent all sectors of the community. The team’s composition should be as diverse and inclusive as possible, crossing racial, ethnic, class age, gender, and other dividing lines, so that everyone in the community feels that her point of view can be heard. Generating ground rules for meetings. Respecting everyone, making clear that everyone’s opinions are equally valued, drawing in those whose thoughts haven’t been heard, dealing with ideas rather than personalities, listening carefully to everyone without interruption, keeping an open mind, being willing to compromise, not allowing anyone to dominate, reaching consensus, etc. Problem-solving. Methods of approaching problems in a group, including such techniques as brainstorming, small-group discussions, and role plays. Substance abuse in the community. This might mean information on the effects and health implications of various widely-abused substances, which substances present the greatest problems, which populations are most at risk, etc. The results of the community assessment, as well as statistics from various sources, can provide team members with a profile of community substance abuse, and some ideas about which directions to move in. Risk and protective factors. What they are, how they work, how they can be used in the context of a prevention program, and some examples. Consideration of resources. Many team members might not have thought about figuring the cost of a prevention program into their plans, or that program resources include not only funding, but also volunteer time, community knowledge about the issue, community and media support, local expertise (from professionals, organizations, and institutions), and the willingness of local officials and the community to change bylaws and policy to favor prevention. Evidence-based programs. What constitutes an evidence-based program, how to sort out those that can be reproduced from those that are specific to the situations in which they operate, and how to tinker with such programs to make them more appropriate for a particular community. Analyze local risk and protective factors. CSAP recommends hiring a consultant – The KU Center for Community Health and Development or a similar organization – to work with the community on this step, but the reality is that many organizations or communities won’t have the resources for that. Help may be available from a local college or university, or from one or more local organizations or individuals. At least some risk and protective factors may also have been identified in the course of the community assessment, and in evaluating community readiness. Some organizations place risk factors for adolescent substance abuse (and other undesirable behaviors as well) in four categories: community, family, school, and individual/peer. CSAP (see Tool # 2) adds a societal domain to these four, encompassing the roles of the national media, the Internet, and the wider culture in forming community and adolescent attitudes and behavior. Protective factors for CTC reside in individual characteristics, in bonding (with family, particularly, but also with mentors and other significant adults), and in the healthy beliefs and clear standards imposed on adolescents by families and the community. Developmental assets (similar to protective factors) for children and adolescents can also be divided into external and internal. Support. People significant to the adolescent encourage, help, and respect her. Empowerment. The adolescent has the opportunity to exercise responsibility, and to feel in control of important parts of his own life. Boundaries and expectations. The adolescent is expected to adhere to clear rules and meet high standards. Constructive use of time. The adolescent has opportunities to engage in meaningful and productive activity. Commitment to learning. The adolescent understands the value of learning and education, and can apply herself in school and other areas of learning. Positive values. The adolescent has developed and internalized a positive value system. Social competencies. The adolescent possesses the personal and interpersonal skills to conduct his own life and to engage in positive relationships with others. Positive identity. The adolescent sees herself in a positive light, and has good self-esteem. The goal here is to understand how these factors operate in your community – which are important and which less so, which are most likely to influence substance abuse among populations at risk. Choose the factors you’ll concentrate on. You should select a manageable number of factors – you can’t address everything at once: that will almost undoubtedly doom you to failure by overextending your capabilities and resources and diluting your efforts in any one direction. You should also select factors that you can truly influence, and in a reasonable period of time. Trying to limit the availability of drugs, for instance, is not just a matter of changing enforcement and/or attitudes in your community. Drugs may be equally available in the next community or neighborhood, or through sources other than those you crack down on. Furthermore, the new sources may be more dangerous to users than the old, both in terms of the drugs they offer and in their potential for violence. You might be able to rid your own neighborhood or community of drugs, but that doesn’t mean you’ve eliminated, or even reduced, their availability. Research and choose an evidence-based approach that can be used with the risk and protective factors you’ve settled on. Evidence-based programs are those that have been formally studied using carefully-structured research designs, and have been found to be effective in preventing substance abuse with the populations they served. Some may have been tested and found to work in different circumstances and with different groups; others may be specific to a given population or situation – a program targeting rural elders, for instance, or one aimed at urban teens. Programs you find may also take different forms. We’ve already discussed universal (aimed at the whole community), selective (aimed at a particular at-risk population), and indicated (aimed at identified at-risk or substance-involved individuals) programs. Another way to look at programs is as either individual or environmental. Individual programs are aimed at helping individuals to develop the knowledge, attitudes, and skills they need to change their undesirable behavior, or to maintain healthy behaviors. Some examples here might be school courses on the chemical and biological effects of alcohol and/or various drugs; parenting programs; smoking cessation groups; and various 12-step and similar programs. Environmental programs seek to alter the environment to make it easier for people to change or maintain their behavior. These might include policy change (particularly as it relates to regulation of substances and enforcement of laws and regulations regarding substance use and abuse); media and other efforts to educate the community about the dangers of substance use (Surgeon General’s warnings on cigarette packs, anti-drunk-driving campaigns); and attempts to change community attitudes and norms. Effective prevention strategies often include both individual and environmental elements. CSAP encourages communities to find programs that work specifically for them. At the same time, for programs it funds directly or indirectly, it requires that, once they choose an evidence-based model to implement, they copy that model exactly. There are obvious reasons for this: once a model has been proven to work, it makes a certain amount of sense to try to reproduce it perfectly, since any change in it might affect its success. If the program you’ve chosen speaks directly to your community and your population, there is no real reason not to implement it just as its creators did. In some cases, however – because communities and populations often differ in subtle and not-so-subtle ways – even the program that comes closest to addressing your situation may have elements that are unlikely to work in your community, or lack elements that would improve its effectiveness. In these cases, it’s important to acknowledge your experience and understanding of the community and its history. If you’re funded by CSAP, you might try to negotiate appropriate changes in the implementation of the evidence-based model you’ve selected. If you’re not funded by CSAP, but are simply using SPF as a framework for a community prevention program, you can make your own adjustments as you plan your program. You can borrow some strategies from another evidence-based program that you’ve examined, for example, or devise some strategies of your own to add on to the program you’ve chosen. It makes sense to start with an evidence-based program. Reinventing the wheel is unnecessary, especially if you already know that the wheel works quite well. Improving the wheel is not impossible, however, and if you have the opportunity and the ideas to do so, you might come up with a prevention program that works faster or more smoothly, and that avoids the particular potholes presented by the peculiarities of your community. Vision and mission statements for the effort. How you’ll gather the resources you need. How much funding will you need and where will it come from? How will you recruit staff and/or community volunteers? The timeline and implementation process for the effort. What will you do by when? Who will take responsibility for what? What results you hope to see in both the short and long terms. How you’ll evaluate the effort. Your plan should be detailed enough that it could still be followed even if everyone involved in the planning suddenly decided to retire to a tropical island and left no forwarding address. Present the plan to the community and gather support. The assumption here is that a prevention effort, to be successful, must be aimed at and involve the whole community. The greater the community ownership of the plan, the more likely it is that the plan will be carried out across the board. Now it’s time to put your prevention program into practice. This phase isn’t easy, but it will be a lot easier if you’ve done a good job planning and have the support of the community. Paying attention at the beginning of and throughout the implementation phase to some specific aspects of it will also make the task easier. Hire staff and/or recruit volunteers. Whether your program uses paid staff or volunteers – or a combination of both – it’s important to find the right people to work in it. Stick to your plan for the implementation process. While timelines can often be affected by external factors – how long it takes to hire staff, a contractor’s work on space, etc. – the implementation of your plan will go much more smoothly if you stick to the process you’ve outlined. It’s often easy to skip steps or to ignore the plan, but those almost always lose you time, cost you extra money, or simply make getting the program off the ground much more difficult. You’ve made a plan for a reason – you’ll generally do better by following it. The same is true for the methods, content, and structure of the program itself. You’ve chosen an evidence-based model because it has proven itself and because it seems to fit your community, your population, and the issues they’re dealing with. It makes sense to stay as close to the model as possible, at least for an initial period, to see if it works as well for you as it did for others that tried it. Continue to pay attention to resources. You may have obtained the resources you need for the moment, but that doesn’t mean you should relax. As we’ll see, your program, to maintain its success, will need to continue. Almost all funding is time-limited (often to a year, or even less), so the need for new or continuing sources never really ends. You don’t have to, and shouldn’t, spend every minute in pursuit of funds and other resources. You should, however, be aware of the program’s needs, take advantage of opportunities that arise, seek new and maintain good relations with current funding sources, and always be preparing documentation and other materials for funding and other requests. Just as the best treatment for substance abuse is to prevent it in the first place, the best remedy for a crisis over resources is to prevent it from arising. Keep the community informed. Through placing news articles and press releases, presentations to groups, maintaining a presence at community events, and other actions, you can broadcast the program’s successes and continue to generate community interest and support. Evaluate the process. Did you do what you set out to do? Did you meet timelines, reach the number of people and the population you planned to, provide the kinds of service or activities you intended in the way you intended? If not, why not? Were there barriers that you didn’t expect? Evaluate the impact of the program. Is the program having the desired effect on the risk and protective factors you’re aiming at? You may be doing exactly what you planned, but it may have little or no effect on your chosen risk and protective factors, or it may be having effects you didn’t count on. You’ll have to find another way to affect those factors, or determine whether you were simply not implementing the program properly. Evaluate the outcomes. Has the effort led to the desired outcomes – lower rates of drug and alcohol use, fewer drunken driving deaths, better services for elders? Again, your program may be affecting the chosen risk and protective factors in the ways you anticipated, but that may not have led to the outcomes you were aiming at. In that case, you’ll have to decide whether you were addressing the wrong risk and protective factors (and which ones you should address), or whether there’s another way to reach your goals. The results of your evaluation should be reassessed on a regular basis (typically once a year), and used to adjust your program to respond to changing community needs or to change or improve areas of it that aren’t working as well as they could. That’s the whole point of evaluation – to make your program better. Finding ways to make the effort stronger isn’t an admission of failure, but rather a way of keeping your work dynamic. No program is perfect – there are always some actions you can take to improve it. Programs that never change generally go downhill over the long run: change revitalizes staff and participants, and leaves room for experimentation that leads to new discoveries. When you make major changes, tell the community about them, and ask for help if you need it. Adjustments may require more volunteers, more funding, a different method of reaching people, or some other change that the community can assist with. The opportunity to provide real aid leads to community ownership and support of the program. The Community Tool Box considers evaluation such a valuable part of any intervention or initiative that it devotes four chapters – 36 through 39 – to it. You can find information about almost any aspect of evaluation in the more than 30 sections that comprise these chapters. SAMHSA/CSAP doesn’t include a sixth phase of the prevention process, but we’ll suggest one here. It will be familiar to regular users of the Tool Box: keep at it indefinitely. You’re actually attempting to create long-term social change, and that takes time. You may see the changes you desire, but that doesn’t mean they’re permanent, or part of the community culture...or that they’ll remain part of that culture without being nurtured. Changes have to be maintained, and that means continuing at least some of the major elements of your prevention program for as long as substance abuse remains a problem in society. CSAP’s Strategic Prevention Framework is intended as a structure for substance abuse prevention programs, although, because of its generality, it could easily be used for other prevention programs as well. 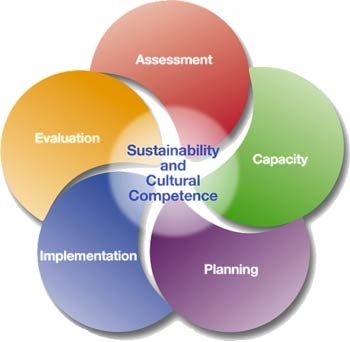 The components of its process – assessment, capacity building, planning, implementation, and evaluation – are similar to those of the other logic models and frameworks described in this chapter. The Strategic Prevention Framework, like several of the Other Models for Promoting Community Health and Development. focuses on risk and protective factors. Risk factors are those elements in the individual, family, peer group, or society that make it easier or more likely for someone to fall into substance abuse. Protective factors, on the other hand, are those elements in the individual or his environment that make it easier or more likely for him to avoid substance abuse.The assumption is that if you can reduce or weaken risk factors and strengthen protective factors in a population or community, its members are less likely to experience substance abuse problems. CSAP provides funding for prevention both through states and directly to organizations. More important for the majority of prevention programs not funded by CSAP grants, the agency also provides web-based tools and information to help with each phase of development and implementation. CSAP’s website also provides links to evidence-based programs that can be used in the implementation phase with at least some degree of confidence that they’ll work. CSAP’s Western Center for the Application of Prevention Technologies. A step-by-step how-to on developing and implementing a prevention program. Information on creating, maintaining, and strengthening effective youth programs. Michigan’s Approach to A Strategic Prevention Framework, from the Michigan Department of Community Health. This is useful information outside the state of Michigan as well. NIDA, the National Institute on Drug Abuse, part of the National Institutes of Health. The Prevention Platform from SAMHSA (Substance Abuse and Mental Health Services Administration)/CSAP’s (Center for Substance Abuse Prevention, a subsidiary of SAMHSA). Technical assistance, funding information, valuable links, tools, etc. The all-purpose build-your-own-prevention-program website. Extremely valuable information. Strategic Prevention Framework (SPF): Key Elements for Use in Prevention Work.